Natick E. Nungezer, Brother-in-law, M, 26, S, GA/GA/SC. Ada Nungezer, Mother-in-Law, F, 47, SC/SC/SC. E-mail written 1998-2006 to Culpepper Connections from Winnie Faye Taylor Parks, Miami, Florida, e-mail address (Jul 2008). E-mail written Feb 2005 to Warren L. Culpepper from Marilyn Tate Houser, e-mail address. + Lucy Culpepper Tate, 13 Jun 1870 – 21 Sep 1938. Margrette Culpepper, Lodger (w/o Roland), F, 19, M, md @ 19, GA/GA/GA. Roland L. Culpepper, 8 Feb 1931 - 4 Nov 1996 Co., FL, White, Volusia Co., FL, Cert # 129127. "Louise was the daughter of Archie Tisdale and Carrie McMillan". E-mail from Cecil Burk2 to Warren Culpepper, 2 Aug 2003. Nell Culpepper, Daughter, F, 10, S, GA/GA/GA. E-mail written Jul 2008 to Culpepper Connections from Casey Cliatt (gd/o #47500), e-mail address. Eugene Culpepper, Son, M, 4 2/12, S, GA/GA/GA. Heard County Court of the Ordinary, Heard County, Georgia Births, 1927-1965, Salt Lake City, UT: Genealogical Society of Utah, 1966 Repository: LDS Family History Library - Salt Lake City, Call # US/CAN Film # 424,612. Miriam L. Culpepper, W, 21 Nov 1922 in Heard Co., GA, d/o L. L. Culpepper. Stella L. Culpepper, d. 1 Nov 1957 at 60 years in Carroll Co., GA; Res. in Carroll Co., GA.
Luther L. Culpepper, d. 12 Jan 1987 at 92 years in Carroll Co., GA; Res. in Carroll Co., GA, 000520. Eugene T. Culpepper, d. 4 May 1990 at 64 years in Coweta Co., GA; Res. in Coweta Co., GA.
Coweta County Genealogical Society, compiler, Coweta Co., GA Cemeteries, Roswell, GA: WH Wolfe Associates, 1986, Repository: LDS Family History Library - Salt Lake City, Call No. FHL US/CAN Book: 975.8423. Forest Lawn Memorial Park, Coweta Co., GA: Eugene Culpepper, 1925 - ____. 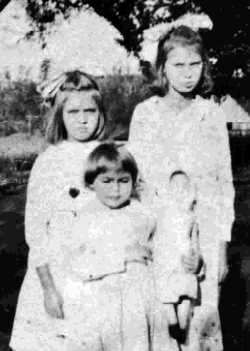 Tommy Eugene Culpepper and Linda Ellen Moore, 30 Oct 1976, Coweta Co., GA.
+ Jennie Wilson Culpepper, 1 Mar 1874 – 20 Dec 1931. Hattie Izora Culpepper, Sister, F, 62, Wid, GA/GA/GA. Mrs. Jennie Culpepper, d. 20 Dec 1931 in Meriwether Co., GA.
Roy L. Culpepper, Son, M, 1, S, GA/GA/GA. As Carl did not appear in the 1920 census (taken 1 Jan 1920) and he is listed as age 10 in the 1930 census (taken 1 Apr 1930), he was probably born in 1920 and not 1919 as the SSDI indicates. J. T. Culpepper, d. 17 Feb 1936 in Pike Co., GA, 11831. Obituary of James Clayton Culpepper (#49675), published 14 Jan 2011. Carl C. Culpepper, d. 3 Apr 1990 at 70 years in Spalding Co., GA; Res. in Lamar Co., GA.
Obituary for Margie Becker Culpepper, 10 Mar 1999. (At same address as Frank M. & Maggie Ison). Spalding Court of the Ordinary, Spalding Co., GA Marriages, 1852 – 1966, Salt Lake City, UT: Genealogical Society of Utah, 1966 Repository: LDS Family History Library - Salt Lake City, Call # Film # 455,613 - 455,625. Raymond Culpepper and Nannie Mae Treadwell on 29 Apr 1924 in Spalding Co., GA, Book H-18. Raymond L. Culpepper, White, d. 11 Sep 1977 at 49 years in Cobb Co., GA; Res. in Cobb Co., GA, Cert # 029955. Spalding Court of the Ordinary, Spalding Co., GA Marriages, 1852 – 1966, Salt Lake City, UT: Genealogical Society of Utah, 1966 Repository: LDS Family History Library - Salt Lake City, Call # Film # 455,613 - 455,625. Norma Evelyn Culpepper and Raymond Calvin Vaughn on 16 Dec 1947 in Spalding Co., GA, Book L-12. Aubrey Culpepper, Son, M, 7, S, GA/GA/GA. Homer A Culpepper, White, Single, born 1922 in Georgia, residing in Troup Co., Georgia, enlisted as a Private in the US Army Air Corps on 23 Oct 1942 in Cochran Field, Macon, Georgia. The Rockdale Citizen, Conyers, Rockdale Co., GA.
26 Jun 2004 online edition. Obituary of Bobby C. Culpepper. From the obituary of mother, LaMerle. Jesse Culpepper and Ella Cleghorn on 20 May 1889 in Muscogee Co., GA, Bk J-501. Obituary of Wylene C. Hollaender (#11103), published 5 Feb 1969. Margaret H. Culpepper, Mother-in-law, F, 70, Wid, AL/GA/AL. E-mail written Mar-Apr 2006 to Warren Culpepper from Confidential, Confidential. Mary L. Culpepper, Dau, F, 1 7/12, S, GA/GA/GA. Joseph S Culpepper and Bera E Culpepper divorced in 1952 in Dade Co., Florida. E-mail written 1999-2006 to Warren Culpepper & Lew Griffin from David Allen Culpepper (#10867), Palm Beach Gardens, Florida, e-mail address or e-mail address.